Earth Science Week is generally the second full week in October! Here are some ideas for creative projects to engage students in Earth Science topics included in the Next Generation Science standards and build informational text skills and writing skills included in the Common Core State Standards. Editor's Note: Best ideas for authentic project work are in the Issues section at the end. Create a digital textbook on how the sun’s energy affects each part of the Earth’s spheres: lithosphere, hydrosphere, atmosphere, and biosphere. 2. It’s Going to Erupt! Create a news report about an upcoming volcanic eruption. Be sure to include an interview with a geologist explaining why they think the volcano is about to erupt and the hazards that will follow. Diagram and explain how greenhouse gases affect how the Earth’s atmosphere traps heat energy from the sun. Design a label for a bag of topsoil. Be sure to include reasons to buy this bag, state how and where it formed, give its composition, and suggest how it can be used. Choose a limestone cave, such as Mammoth Cave in Kentucky or Carlsbad Caverns in New Mexico. Design a brochure or interactive kiosk that can be used by visitors to the park to learn more about how the cave formed, what features they will see and how these features developed. Create an animated simulation demonstrating the impact landslides, mudflows, slump, or crepp has on the environment. Until the 1960’s there was widespread skepticism about continental drift. Create an animation demonstrating how Pangaea formed and then broke apart, describing the process and including details to overcome skepticism. 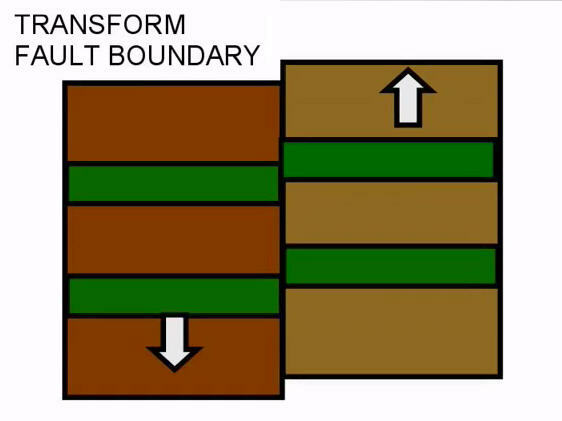 Create an animated presentation on the main types of faults: normal, reverse, and strike-slip faults. Describe each fault and create an animated simulation to show how they move. Create an interactive presentation that illustrates a cross-section of a volcano, labeling the magma chamber, pipe, vent, crater, and lava. Animate the process of an eruption. Illustrate and animate the four different types of fronts: cold, warm, stationary, and occluded. Be sure to include the direction it is moving and the kind of weather at each type. Tell the story of the rock cycle from the perspective of an igneous, metamorphic, or sedimentary rock. You might also show a drop of water in the water cycle or nitrogen through its cycle. Write a narrative for a trip to the center of the Earth, describing each layer you are travelling through and how the temperature and pressure are changing. Be sure to include diagrams and even animation. Tell the story of a visit to a mid-ocean ridge in an underwater ocean vessel like the Alvin, including the features of the ocean floor near and along the ridge. People have lived near volcanoes for thousands of years. Choose a major eruption and tell the story of the eruption. Be sure to include benefits of living near volcanoes such as hot springs, and rich top soil. Craft an original narrative that personifies fog, addressing how it forms as well as the impact it has on coastal and valley communities of plants, animals, and people. Who should be president of the Earth’s spheres? The sun? Oxygen? Craft an argument that includes reasons why your chosen component is most crucial to the lithosphere, hydrosphere, atmosphere, and biosphere. Use what you know about weather and climate to inform others where they might want to buy a home depending on the weather they like. Be sure to include climate zones, leeward and windward sides of mountain ranges, altitude, and ocean currents. Many states, and even cities, are looking at sponsoring and promoting the use of hybrid cars. Explore the advantages and disadvantages of these vehicles and craft an argument about the costs involved and whether this is money well spent. A severe drought in a farming region threatens to produce another Dust Bowl. Create a public service announcement about soil conversation. It should identify the danger of soil loss due to erosion. It should also describe the steps farmers can take to conserve the soil. Should the government insure everyone against flood damage? Should there be rules restricting where houses can be built? Research the controversy around flood plains and housing. Develop a plan to reduce damage that includes costs and who should pay for them. Earthquakes cause damage to buildings and other structures. In an area with frequent earthquakes, list the top 3 structures that should be seismic safe and describe ways to modify them to make them able to withstand serious earthquakes. Explore how your school uses energy. Choose one type of energy use and develop a plan that summarizes your findings and proposes suggestions for reducing energy use in this area.